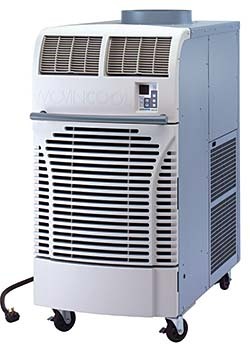 Office Pro 63 is designed for fast cooling in large-scale office or server room applications. Cooling capacity of 60,000 Btu/hr. Unit requires no installation and operates on 460V power. Included condensation pump pumps water to remote drain to help ensure uninterrupted operation. Dimensions are 30-by-52-by-64 inches and unit weighs 705 pounds. Max duct lengths of 40 (cold duct hose) and 100 feet (hot duct hose). Operating modes are 24/7 programmable.